Florida's Board of Education voted to significantly reduce costs to take and retake portions of Florida's mandatory but pricey teacher certification exam, also known as the FTCE. The vote represents the first significant price adjustments made to FTCE fees since the state increased testing fees by up to 800% back in 2008. [In 2014, fees were modified for retaking some tests containing subtests but there was no overall changes in cost]. The lower fees take effect April 22nd. According to the new fee structure, first proposed by the FL Department of Education, the most significant savings will impact examinees who have to retake the controversial General Knowledge (GKT) portion of the exam. The GKT is composed of four sub-tests: essay, English language skills, reading and mathematics. A public school teacher must pass all four sections of the GKT before they can earn a permanent teaching certificate in Florida. 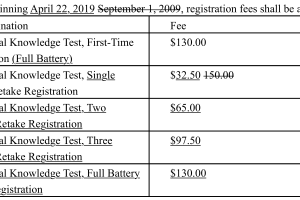 Costs to take the battery of four exams is $130. However, if an examinee has to retake a portion of the test, the cost jumps to $150 even if the examinee has to retake just one subtest. Since the test was revised and made tougher in 2015, failures on the GKT and other portions of the FTCE have increased up to 30% on some parts. The new fee structure reduces retake fees on the GKT to $32.50 per subtest. 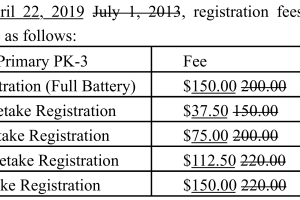 So, if an examinee has to retake just one section of the GKT, the retake fee will be $32.50 instead of $150. 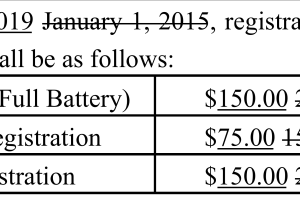 If an examinee has to retake two sections, the fee will be $65 and so on. The lower costs represent a 78% decrease in fees for the exam. “This is great news for Florida teachers and the families who rely on them to provide high quality education in classrooms throughout our state. We will continue working to ensure the right policies are in place to enable our students to succeed,” Governor Ron DeSantis said. According to a press release issued by the FL Department of Education, the lower fees comes will help save the state's future teaching workforce as much as $5million per year. Prior to 2009, the state legislature helped pay for the tests. 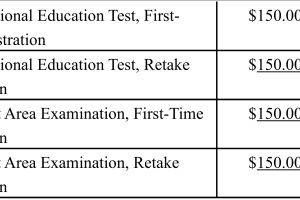 At the time, all tests and subtests were $25 with no additional retake fees. Today, portions of Florida's teacher certification test cost examinees up to $200 per section and retakes are an additional $20 more. The tougher tests combined with pricey testing fees have caused many frustrated examinees to question if the state is profiting off those who repeatedly fail the test. Over the the last two years, we've spoken to dozens of frustrated examinees who spent thousands of dollars to take and retake portions of the test. One substitute reading teacher recently told us she had taken and failed the math section of the GKT 20 times. A state spokesperson said testing fees cover costs to oversee and administer every part of the exam including developments, administration, scoring, reporting and quality control of the FTCE, according to an FLDOE spokesperson. The FLDOE contracted those tasks to testing giant, Pearson Inc in 2011. According to the state's list of government contracts, the state's contract with Pearson Inc was worth more than $58 million as of the end of 2017. 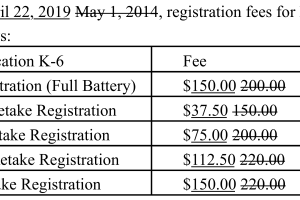 The new fees will take effect April 22, 2019. Click here to review the proposed new rule, fees and download the word document.